The Descended - A year since the last special anniversary. Comic 19 - A year since the last special anniversary. 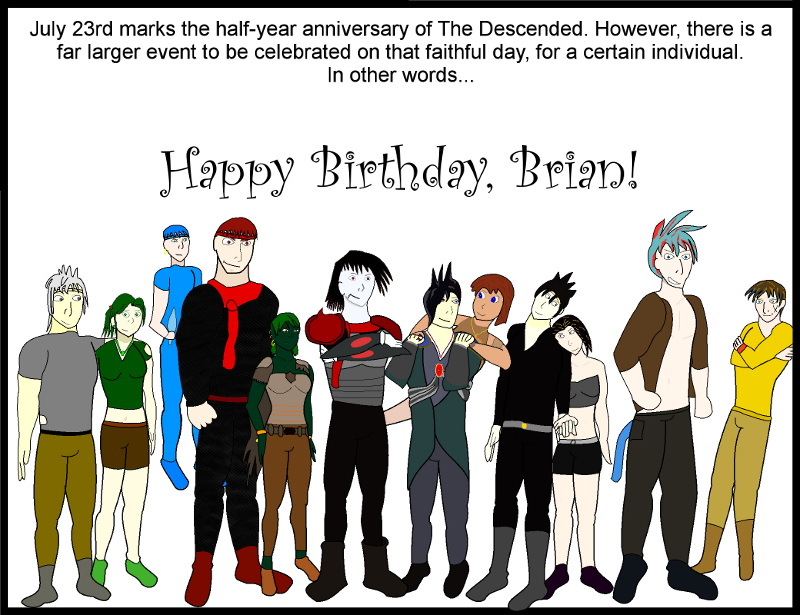 So this comic is, obviously, followthrough from last year meant to both celebrate The Descended's half-year anniversary and simultaneously my birthday (not to mention, the day I devoted myself to my webcomic), but there's more to this page's intention. 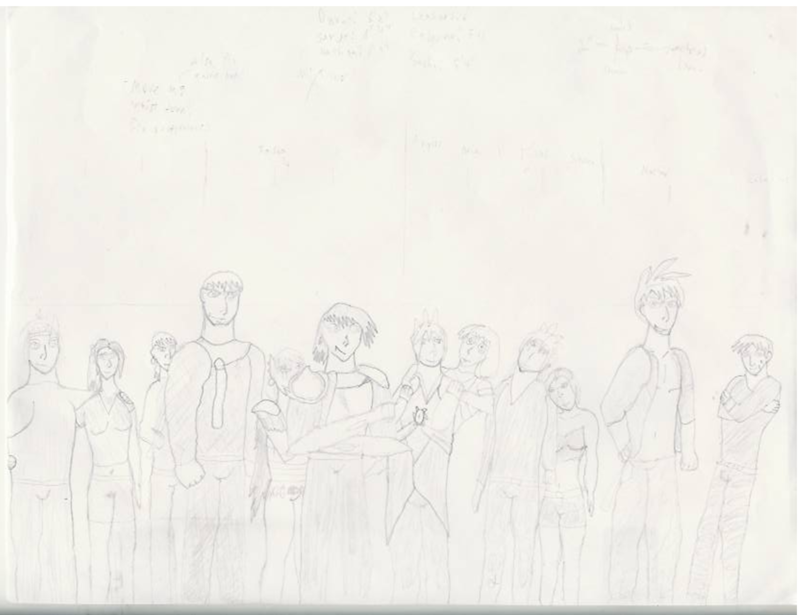 The idea was to draw all 12 current main cast members and to make them look as gorgeous as they could be--while also showing off the character's heights. Basically, to show off my artistic skill with the best I can draw, posting it at 6 am. I pretty much failed at all those goals miserably. :P (Especially the time one--it's still my birthday as I post this, but by the time most people read this, it'll be the 24th to them. :P) The last time I had this goal (and for a less-ambitious single character! ), it took me months, from the sketch to the final digital product. -Enlecar's leaning against a wall. (Represented by the panel boarder.) This invalidates his height, which should be 5'11". So you'll actually be seeing a regular update in the near-future. Go Brian go Brian go Brian! Thanks for taking a read at my comic. It makes me happy. If I had my way, I'd be reading every single CF comic, and commenting on every single comic released, and supporting them all with my insight. Happy Birthday, as well as anniversary, Man! Hope you get lotsa gifts! is this drawn in ms paint? Nope, hand-drawn by a sketch (you can see the original sketch here), and then, drawn in GIMP.